The Cape Coast is ‘a blue zone’, a term coined by National Geographic, where people tend to live longer, healthier lives finding a balance between technologically driven and more laid-back lifestyles. Rumours persist that the Cape Coast – where ozone-charged breezes vitalise the atmosphere and the setting sun reflects shades of red across cloudy skies on lazy evenings – is among the healthiest places on the planet. Perhaps the longevity of some residents gives credence to a 1961 newspaper report extolling the “elixir vitae (elixir of life) for which the district is renowned”, created by cross winds weaving the clouds and the Pacific Ocean, unobstructed for endless empty nautical miles, battering the stony beaches? In today’s terms, the Cape Coast is ‘a blue zone’, a term coined by National Geographic, where people tend to live longer, healthier lives finding a balance between technologically driven and more laid-back lifestyles. The area has its own microclimate. It can turn on a sunny day when it’s raining in the cities, be deceptively calm when the wind is buffeting the plains, then curate its own wild display when wind and tides hammer the shingly beach with mountainous waves. The Cape Coast is an umbrella term that quickly gained traction when adopted in 2009 by groups working toward coastal protection and beautification and a more cohesive identity for Haumoana, Te Awanga and Clifton. It’s a 15-minute drive from the twin cities of Napier and Hastings and the village of Havelock North and a base for many thriving businesses from tradespeople to artists, craftspeople and digital-era entrepreneurs. According to the 2013 census the overall population was 2,260, up only 20 on the previous decade, with a more significant increase expected when 2018 results are available. Around 120 new homes in sub-divisions are expected to be completed by 2020. There are many reasons to visit this stretch of coast between the Tukituki River mouth and the southern cliffs of Cape Kidnappers. 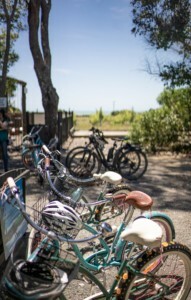 During the summer months and holiday weekends a steady stream of traffic and cyclists head out to soak in the atmosphere, explore or visit the award-winning wineries and restaurants, museums, zoo, world-famous gannet sanctuary and other attractions. A visit to the coast might be as simple as admiring the scenic beauty, flicking out a baited line and relaxing until you get a bite, having a picnic, camping, glamping, swimming, surfing, boating, cycling or just taking a leisurely walk. For its size the Cape Coast offers plenty in the way of hospitality. 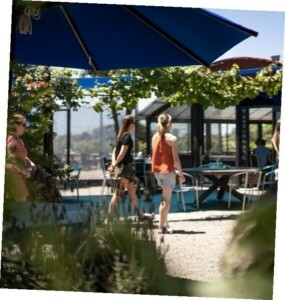 Elephant Hill (recently awarded Best Winery Restaurant & ‘Two Hats’ by Cuisine), Clearview Estate and Hygge (formerly Clifton Café) have well established restaurants, and wine tastings are offered at perennial top wine award winners Clearview Estate, Beach House Wines and Rod McDonald wines at Te Awanga Estate. The music scene is lively over the summer months with groups and solo artists regularly performing at Gannets Bar, Clearview Estate and Hygge with Sunday Sessions at Te Awanga Estate until February. Major replanting and beautification across the length of the Cape Coast is currently underway as part of the Hastings District Council Cape Coast Reserves Plan. And a more collaborative joint council approach to coastal protection has begun to restore a sense of hope in the future. A key to revitalising the area came in 2012 when the Rotary Pathways “landscape” project backed by the Regional Council created a limestone cycle track from Black Bridge to Clifton which now intersects with Napier, Clive and Havelock North. Overlaying the track, now used by 17,000-20,000 people a year, is the Te Matau-a-Māui Art and Heritage Trail with signage highlighting natural and historical features that are mostly overlooked in the reference books. In Boyd’s history of Hastings, City of the Plains (1984), there’s a single mention of Haumoana, Te Awanga (Clive Grange: see Haumoana) and Clifton, all in the same paragraph. In Matthew Wright’s Hawke’s Bay, the History of a Province there’s one mention of Te Awanga. And yet the area has a rich history with archaeological evidence of a strong Maori presence over 800 years. Whatonga, from the Kurahaupo waka, took up residence between Te Awanga and Clifton around 1250 A.D, calling his first house Heretaunga, later adopted for the plains of the wider region. His famous son Tara-nohu was born there and chiefs including Hikawera II and Hawea also had hilltop pa.
Captain James Cook had his first unfortunate encounter with local Māori off the coast of Te Awanga in October 1769 resulting in Te Matau-a-Māui (or Te Kauwae a Māui, Māui’s fishhook/jawbone) being given the European name Cape Kidnappers. The Cape Coast has its share of entrepreneurs and dreamers. Some have been game changers; the world class Cape Kidnappers Golf Course, luxury lodge and The Farm restaurant; the Cape Sanctuary wildlife preservation project; the groyne at the Tukituki river mouth; the Clifton rock revetment; and the plan for public art along the Te Matau a Māui Art & Heritage trail. Some dreams, however, were too audacious to get off the ground. Take W.B. Rhodes, one of New Zealand’s earliest land speculators, who, in 1839 imagined the area as a seaport and capital for Hawke’s Bay. He claimed to be one signature short of purchasing a massive tract of land from Wairarapa to Wairoa when his trading station burned down and Māori and missionaries railed against his bold proposal. After the signing of the Treaty of Waitangi inside the Tukituki river mouth on 20 June 1840 he was stripped of most of his claim, but he and brother Joseph eventually leased or purchased much of the Cape Coast and beyond calling it Clive Grange Estate. In 1879, new owner Land Wars veteran Major-General Sir George Whitmore picked up on Rhodes’ vision proposing “the most flourishing port and city on the East Coast”. Whitmore, and ten investors in the Clive Grange Estate and Railway Company Ltd, planned a harbour sheltered by Cape Kidnappers, residential development on both sides of the Tukituki River and a bridge for road and rail access. Only six weeks after the ‘South Clive’ prospectus was issued, it was all over; the company failed to raise the money, the market slumped and the focus was now on Napier Port. The isolation of the Cape Coast was finally broken when a single lane ‘Black Bridge’ opened in May 1888 raising the possibilities for the area still dominated by three large farms. When families headed to Clive Grange Beach and campground at the Tukituki river mouth during the summer holidays, headmasters noted in early February 1904 that many children were still absent from school. In the first decades of the 20th century, the throng of drays, early motor vehicles and cyclists continued with Burden’s Camp near the Te Awanga Lagoon and Maraetotara River where row boats and yachts operated an added attraction. Clive Grange was divided into small farms and residential sections for what was to become Haumoana, with the former Clifton Station oats paddock forming the base of what become Te Awanga. On October 6, 1956, the new two-lane Black Bridge opened bringing another milestone in the area’s evolution. In recent years many homes have been offered as holiday rentals; some booked months in advance, as people flood into Hawke’s Bay for a break or to attend Art Deco week, Mission or Black Barn concerts, Horse of the Year and other events. Two recently upgraded freedom camping reserves, Haumoana Domain and Clifton Reserve, along with three paid camp grounds; one at Te Awanga and two at Clifton, can swell the local population by around 1,000 during peak periods. On crossing the Black Bridge, there are two entrances to the Cape Coast, one sharp left toward Haumoana and the river mouth, the other keeping right along the straight that curves into East Rd where the ocean comes into view. Here you are flanked by two local attractions – the Hawke’s Bay Farm Zoo and the imposing warehouse boldly branded as ‘the world’s largest collection of British cars’. From the early 1970s Ian Hope’s passion for Morris Minors turned into an obsession that gave birth to his British Car Museum literally stacked with vehicles and memorabilia. 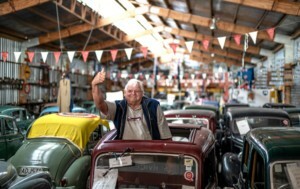 He outgrew his first museum in Te Awanga moving to an old packhouse in 2000 which now houses over 450 vehicles, which he says echo the first car ownership experience of many New Zealanders over 45-years of age. The vehicular nostalgia runs the gamut from Austin, Morris, Triumph, Vauxhall, Jaguar, Hillman, Rover, Wolseley and at last count over 40 Morris Minors including ‘ute’ and station wagons — 80% still in running order. Across the road is the Hawke’s Bay Farmyard Zoo established in 2004 by Dyan and Cliff LeCompte in response to tourists and passers-by leaning over the fence to engage with their animals. 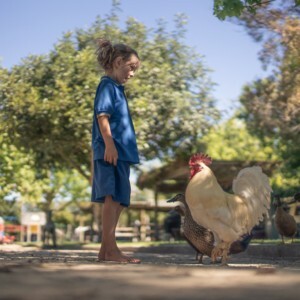 On acquiring a growing menagerie for their petting zoo they hosted 18,000 people in opening year with families feeding the animals and enjoying the picnic space. Today around 23,000 drop in annually to engage with their goats, sheep, highland cattle, ponies, donkeys, llamas, deer, pigs, calves, ostriches, emus, cockatoos, turtles, guinea pigs, rabbits and pheasants. They no longer do horse trekking so it’s now down to pony and train rides, children’s parties, and 15 surrey bikes for groups to take out along the cycle trail. Cape View Corner is the commercial centre; a block of shops including the popular Gannets Bar, a takeaway and a well-stocked Four Square. Across the road are the remaining homes in the so-called “Haumoana extension” (often referred to as the H21, although only 16 remain). This row of established homes and baches has, much to the frustration of locals, become the default reference point for media when they’re occasionally buffeted by high seas or when discussions about climate change arise. While the welcome to Haumoana and Te Awanga signs on Clifton Rd are about 1km apart, Hastings District councillor Rod Heaps, related to the pioneering Burden family of Te Awanga, insists the white bridge in front of Elephant Hill is the boundary. The land either side of Elephant Hill restaurant and winery was once a 200 acre (81 ha) tobacco farm owned by German entrepreneur Gerhard Husheer, who from 1912 planted different varieties and built curing barns and kilns. His first successful harvest was celebrated with the community, but mildew destroyed the following year’s crop. Random tobacco plants continue to appear in local gardens and paddocks more than a century later. To the south of the old tobacco farm, Husheer’s friend Anthony Joseph Vidal pioneered local winemaking. He arrived in the country from Barcelona, in 1888 aged 22-years, learned the craft from his uncle, Joseph Soler in Whanganui, then expanded from an old racing stables at Te Mata to Te Awanga in 1915. After a lull of several decades when local vineyards were left to deteriorate, Tim Turvey and Helma van den Berg established Clearview Wines in 1989 on the old Vidal’s site. They led the charge for a resurgence in winemaking, winning 10 medals and a trophy in just over a year. Co-owner Helma van den Berg said she and Tim had a vision to create an alfresco Mediterranean-styled lunch restaurant where they would sell their own wines, which they continue to do 30 years on. 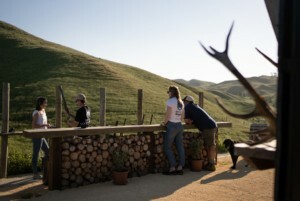 Today the Cape Coast is one of Hawke’s Bay’s primary winegrowing areas, with awards and medals regularly presented to boutique vineyards for a range of red and white varieties. The area is particularly suited for classic white varieties, including Chardonnay, Sauvignon Blanc and Semillon produced by Clearview Estate, Elephant Hill, Beach House Wines and Te Awanga Estate. Grapes are also grown for other prominent Hawke’s Bay wineries. Each block of land along the coast has it own story, having been put to many productive uses down the decades. Two historic properties and a luxury homestead were merged into the 400 acre (162 ha) Te Awanga Downs farm in the mid-1970s by Chris and Marki Nilsson. At the rear of the property is the Clifton Country Cricket Club, which rated a mention in the World’s Most Remarkable Cricket Grounds in 2016. The club is involved in the Cape to City environmental restoration project, re-establishing native species and regenerating birdlife with over 10,000 plants recently established on the grounds. Around 2016 part of the Nilsson’s property became the base for Outfoxed, an adventure playground set up by son Matt Nilsson and wife Amy. 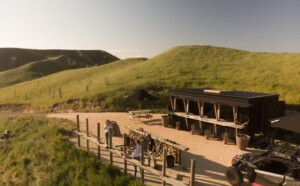 It offers clay bird shooting, archery, paintball, motorbike rides and golf. As you head past the Te Awanga Hall and domain on the ocean edge, you’ll spot the popular Te Awanga Point surf break off the mouth of the Maraetotara River. Toward the end of Clifton Rd, opposite Hygge Café, Wool World has been established in the original red oxide Clifton Station shearing shed, built in 1886. It’s the home of wool industry memorabilia collected by Ian Richardson including pens, shearing gear, wool presses, valve radio, wool bail stencils from old Hawke’s Bay stations and other items true to the era. Photos, maps, shearers graffiti and other history of the Gordon family’s Clifton Station are also featured. The working museum of the wool industry offers blade and mechanical shearing displays twice a day during the tourist season, as well as demonstrations of wool classing, spinning and weaving. Nearby is the pickup point for both overland and coastal tours to the world-famous Cape Kidnappers gannets, featured on the Hastings’ City logo. 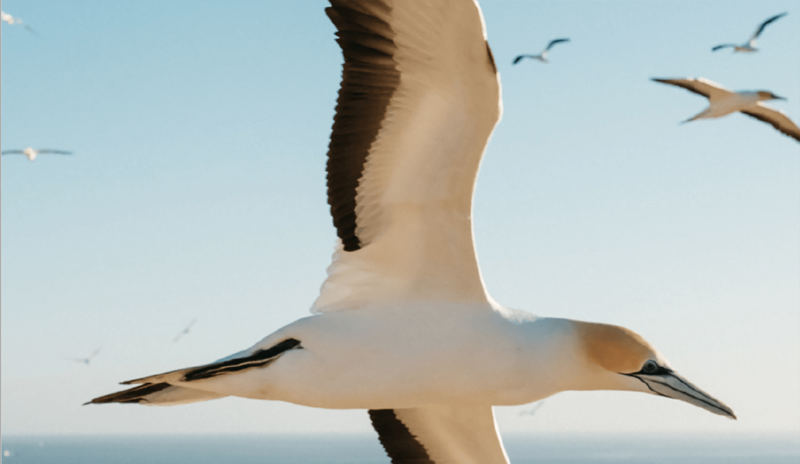 The graceful Australasian gannet with its distinctive black eye markings and pale gold crown, or as one commentator described them, “pale honey-gold heads and Cleopatra eyes”, have been nesting at Cape Kidnappers since the 1870s. Around 22,000 people visit between October to May each year when chicks are being fattened up for their own trans-Tasman flight. The 12 ha Cape Kidnappers Reserve, one of the world’s most accessible mainland colonies with around 20,000 gannets in peak season, was gifted to the Crown by property owner Frank Gordon in 1914. The birds with a two-metre wing span, fly for hours to catch food for their young in a spectacle that can often be observed closer to shore during the annual “boil up” when smelt, herrings and whitebait leave the river systems. The sound of the gannets, gulls and other birds working with bigger fish to herd the migrating shoals creates an equivalent human frenzy as young and old run with their fishing lines to haul in crazed kahawai as the sea literally boils with activity. Clifton Motor Camp and beach has a long history of being the ideal holiday spot, offering a sheltered beach with safe swimming and fishing, although encroaching erosion has changed the terrain considerably over time. The Gordon family donated the beachfront to the Crown in 1936, although adjoining property owner, Colonel Neilson continued to drive his sheep among those who were swimming and sunbathing for the next 15 years. The Clifton Marine Club with its ramp, winch facilities and club rooms was formed around 1960, for members who lay cray pots, go paua diving, netting, long lining or deep sea fishing. Neville Bawden, who’s been a member since he was 11 years old, says near the Cape at 70-100 metres depth there’s a good array of species – gurnard, groper, kingfish and terakihi, trevally, blue cod and even tuna. Everyone’s welcome at the club, with many taking advantage of the facilities or entering the fishing competitions. Observers are often amused and confused with the dozens of boat trailers bobbing about in the sea. What they’re seeing is a classic Kiwi innovation that resolved the perennial problem of launching boats in the choppy, steep, gravelly foreshore which damaged hulls and motors. In the late 1960s regular camper and fisherman Fred Hickey put larger wheels on his boat trailer and made a cradle and polystyrene floats so it could be ‘parked’ 200 metres out to sea, then winched ashore after a day’s fishing. At first many of the locals thought he was crazy, but it proved so successful that nearly every boat in the Clifton Marine Club soon converted to the system. After ad hoc efforts were made to protect access to the camp and club and the loss of three roads, a more serious rock revetment was built between 2016-2018 as part of a wider plan for a more attractive end point to the popular coastal destination. It’s a relief, says Bawden, to see the road finally protected but a shame it wasn’t done two years ago, “we would still have another 20 camp sites left”. While positive about growth and development, he says the Cape Coast is still “in a kind of limbo” waiting for further positive action following four years of joint council coastal hazard meetings. An action plan before Hastings Council now promises to prioritise protection where that’s deemed practical and affordable. Otherwise, erosion will not only undermine more properties, infrastructure and parts of the cycle track, but the confidence of local residents and businesses as well, with visitor dollars seriously declining. If coastal protection and beach crest maintenance is actioned, the Cape Coast could confidently continue its trajectory as “a jewel in the crown” to quote Hastings mayor Sandra Hazlehurst, as a location that gives Hawke’s Bay a literal edge.